With the winter meetings underway it's time to sift through the bluffs and semantics that are the baseball offseason. Fans will hear any number of terms describing the current rumor or state of negotiation regarding a free agent, so I am here to offer a helpful guide to figure out what it all means. Let's get started. Internal Discussions - Often times, when a team is facing a difficult decision on a star player, the wonderful world of baseball writing will say that the organization is having "internal discussions" about said player. So what does this really mean? Nothing. Let's be realistic, if you've had a player - like Prince Fielder - in-house for several years and known that a decision on trading him had to be made in the near future no sudden meeting of the minds is going to provide a breakthrough in that players direction. And what is an "Internal Discussion," anyhow? Anytime Doug Melvin and Gord Ash talk about a player aren't they having an "internal discussion?" So the Brewers had an "internal discussion" about big Prince and still don't know what they will do with him. Shocker. In Talks - When this is directed toward a free agent, it likely means that the deal won't get done. Or at least won't get done anytime soon. Cliff Lee has been "In Talks" with the Yankees since free agency started, he's still a free agent. Paul Konerko has been "In Talks" with the White Sox since last season as well and where is he? Still a free agent. Meanwhile, how long were Jayson Werth and the National's "In Talks" for? We don't know, because we never heard about them. That deal just popped up and was done. The trade version of "In Talks" is pretty similar. Look no further than the Brewers deal for pitcher Shaun Marcum, we never once heard that Milwaukee was "In Talks" with the Blue Jays until, all of a sudden, a deal was done. On the other hand, the Crew has been "In Talks" with the Dodgers, Braves, Orioles and White Sox regarding Prince Fielder and others yet no trade has reared it's ugly head. You may make the case that the Adrian Gonzalez deal breaks my definition, but not true. That trade was "In Talks" for days and nearly fell apart. Took pretty long didn't it? Just like my definition states. Zero Interest - Back the truck up, because they want they guy. The best example of that may be the Dodgers and Brewers rumor that circulated yesterday. Jonathan Broxton and James Loney for Prince Fielder? That got the "Zero Interest" label from both teams (also excepted: No Interest, We aren't considering that). There is some truth to that statement as well, as that trade was assembled both teams had "Zero Interest." But does that mean that neither team had an interest in making a deal there? Probably not. The Brewers don't need a closer and the Dodgers need more offense. There is likely an interest on both sides but the initial rumor wasn't going to cut it. But once you sift through the smoke screen, there may be something after all. Considering Offers - In regards to free agents and trade candidates the definition for "Considering Offers" is about the same. When a team or player has heard what people are willing to offer them and takes that step of considering it means one thing: They think they are worth more. 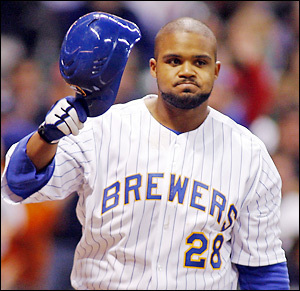 In recent months the Brewers have Considered Offers for Prince Fielder and Corey Hart and not traded them because the value that they would get back was not up to par. The Royals have considered offers for Zach Greinke but haven't traded him because they want more. Free Agents such as Cliff Lee and Brandon McCarthy have considered offers because they want more money than they've been offered. It's pretty simple really, when you read a team or player is "Considering Offers" you may as well read it as "We Want More." Not Interested in Talking About That - This is a Doug Melvin staple. Essentially it means that he is trying to make something happen here, but he doesn't want to blow it up by giving up too much information. And you can't blame him. If it becomes known that a team is pursuing a free agent or trade candidate other teams can jump in to try and drive up the price or try and keep the player away from a competitor. ESPN is Reporting - You might as well just throw that out the window. If ESPN is reporting it then the rumor is massively incorrect or has been reported on by several other major news sources. ESPN is a day late and a dollar short when it comes to baseball. Any more non-committal phrases we need defined?